Navigate: Home → Alphabetical → Abakanowicz Magdalena [Link Partners] [Help] → Help support the e.Gallery! Magdalena Abakanowicz was born on June 20, 1930 in Poland, near Warsaw, to a family that traced its heritage back to Genghis Khan. Her home life was disturbed by the occupation of Poland by Germany and then Russia. She stayed in Poland through the years of Communist rule and then through the changes under the Solidarity movement and afterwards. Her sculpture often reflects the emotional heritage of her political environment. Abakanowicz studied at the Warsaw Academy of Fine Arts, 1950–55, and received honorary doctorates from the Royal College of Art in London and the Academy of Fine Arts in Lodz, Poland. Magdalena began working as a painter, as a weaver and as a sculptor. Working in the fiber arts, as a weaver, she moved to other media including clay, wood, and sacking. She is noted for groups of large figures which she has called “Abakans.” Her work is in many major public museums. 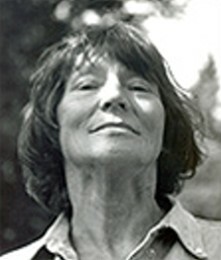 Magdalena Abakanowicz taught at the State College of Arts in Poznan, 1979–1990, and she was appointed a professor in 1979. She has been a visiting professor in the US. In the 1990s she designed a model of an ecologically-oriented city, and has also choreographed dance.